Download Torch Browser latest version free. 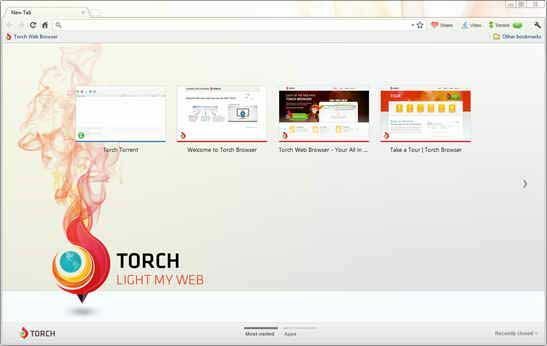 Torch Browser is a web browser designed. This software offers some unusual features. There are semi transparent drop zones at the left and right sides of the browser window. Once the users know where they are and how to use them they can be made completely invisible. The left drop zone is for sharing and the users can drag something off a page like text, an image or a link and a panel of tiles pops up with Face book, Google and Twitter. This function allows the users that they can share it with their followers and friends. And on the right in the other drop zone are tiles for searching the web, Wikipedia searches, image searches and many others. The users will find that there is also a button for general Face book and Twitter posts. There is a video downloader is built into Torch, the media button in the toolbar is enabled when there is a video clip playing on the page. The users can click it and the video can be saved to disk as an flv file. There is a Bit Torrent client is built in and the toolbar button opens a new tab with all the standard controls which users would expect.